I've made an interactive list that helps you find which viewers (etc.) are bundled with Opus and which add-ons are available to make Opus do more. The list includes several plugins/features that have not been mentioned here or at the forum. Screenshots are included, where useful, to give you an idea of how things are before you install anything. You can filter the list to show just what interests you. For example, you can make it show only plugins which support 64-bit & USB mode, and don't come bundled with Opus, so that you don't waste time looking at things you already have or cannot use. Maybe you'll discover something new. Hope it's useful! Fix for Desktop context menu crash in conjunction with the NVidia v185.85 drivers. Fix for problem triggered by generating WMV thumbnails (files could get locked and never released until Opus was shutdown). Fix for error when dropping files to Zip files in the Folder Tree. Fix for problem where RAR files with comments could not be opened in the x64 version. Fix for crash that could occur in the initial configuration wizard. Fix for crash when editing button lines longer than 1024 characters. Fix for crash that could be caused by launching FrontPage via DDE (e.g. from the context menu for a .html file). Fix for crash when viewing files in the Nokia phone namespace. The Zip Auto-Extract function now sets the current directory of the launched file correctly to that of the extracted files (so that any associated files like DLLs will be found). Shortcuts launched from Opus (e.g. by double-clicking in a Lister) now have their current directory set correctly if there is no value defined for the ‘Start In’ field (previously the CD would be that of the shortcut’s target, whereas the correct behaviour is the directory the shortcut itself is in). Pressing Ctrl-X (Clipboard CUT) with nothing selected no longer clears the clipboard. Image conversion now works for all selected font files instead of just the first. Fix for JPEG-EXIF rotation offset not always being lossless when it could have been. Image Converter can now reset EXIF rotation tags in JPEG files. When clearing EXIF rotation, the orientation field is now set to 1. Previously the entire field was nulled-out which could potentially cause problems with some EXIF readers. Cropping an EXIF-rotated image in the viewer used to rotate the image an extra time. New Ogg/FLAC AudioTags plugin which works on x64 systems. Adds/improves support for many camera models. Raw thumbnails now display the correct dimensions and are, where possible, correctly rotated. Separate decoding options for the Image Conversion function so you can use Opus to produce high quality raw conversions without slowing down file browsing. Added support for RGBA (alpha) Photoshop images. New JPEG2000 plugin which supports x64 and is much faster than the old one. TGA plugin: Added support for alpha channels, pre-multiplied alpha, indexed color, and greyscale. Fixed problems with swapped red/blue channels in 16-bit images and small/corrupt thumbnails for some files. The Select Destination dialog now shows all levels of Favorites in the drop-down rather than just top-level ones. Several other minor fixes/improvements to the dialog as well. Selecting a Content Type format from the drop-down list no longer applies sections of the format that are turned off. FTP changes to support WindowsCE FTP server. The Go /controls command could cause a duplicate tab to be opened if the right-most tab was locked when it was executed. Fixed problem with unreliable “Automatically select next file when viewed image is deleted” option for Viewer Pane. Fixed layout issue when Find Panel was opened and there was a toolbar beside the Viewer Panel. If inline rename failed in an FTP directory, the retry dialog would reveal the full path of the FTP file including the username/password. The ‘Run Opus on startup’ option now uses a shortcut in the Startup program group rather than the registry. Fixes problems a small number of people had with Opus starting too early during boot. The default behaviour for single-line functions is now asynchronous again. Now, only multi-line functions default to running synchronously. Of course this behaviour can be changed using the appropriate @ modifiers. Fix for the Replace dialog’s thumbnail generation getting in the way of the file move/overwrite if the dialog was dismissed very quickly. If you've been experiencing Explorer.exe crashes when the Desktop context menu is used then you're probably affected by a problem caused by the combination of Opus and the latest NVidia drivers (v185). A fix for the problem has been written and will be included in the next Opus release, which should be out fairly soon. 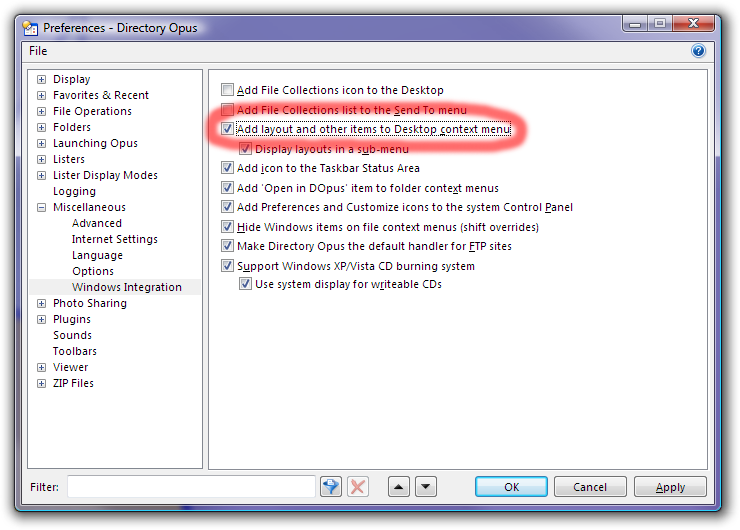 To disable the Opus items, go to Settings -> Preferences / Miscellaneous / Windows Integration and turn off Add layout and other items to Desktop context menu. 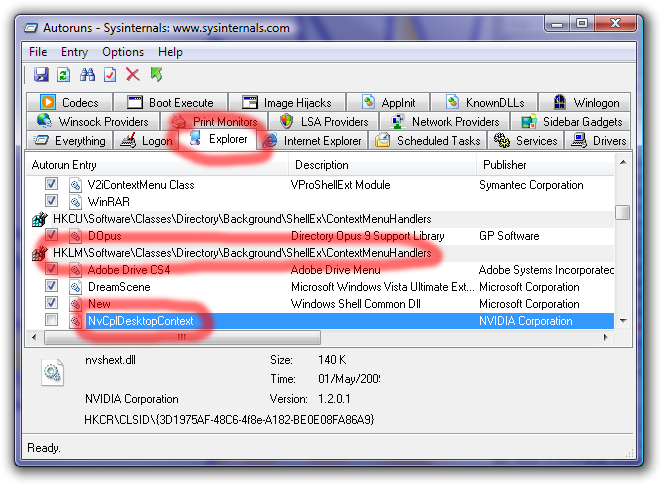 Alternatively, you can disable the NVidia item using SysInternals' AutoRuns, as shown below. This does exactly the same thing as using ShellExView. All of the changes discussed above will take effect immediately. There is no need to restart anything.